Yesterday Josh and I met with Ambarella and went on a tour of their exhibits. The main topic was their new line of SoCs, along with the various products and projects that have branched off from what these SoCs and their video encoding and decoding capabilities can enable. 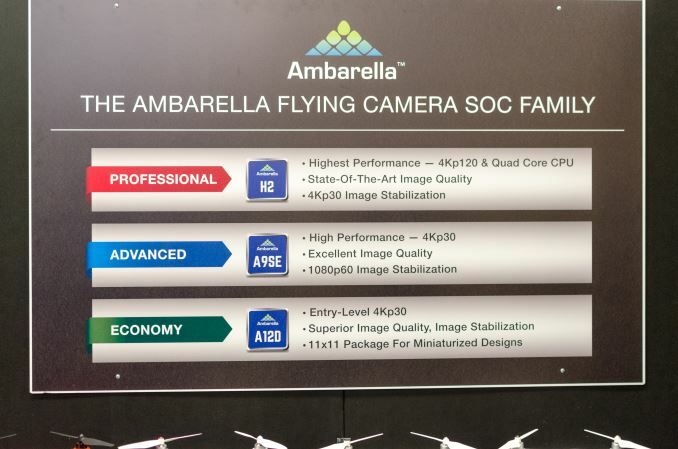 The high end SoC in Ambarella's line of chips for cameras is H2. H2 is built on Samsung's 14nm process, and it incorporates a quad core 1.2GHz Cortex A53 cluster, and its capable of encoding 4K HEVC video at 60fps, or 4K AVC video at 120fps. The latter makes it capable of doing 4K slow mo videos by playing back the 120fps footage at 30fps. H2 also includes support for capturing video with 10-bit color, as well as support for HDR which has recently been integrated into the Blu-ray and UHD standards. The next SoC in Ambarella's line is H12. H12 isn't shown in the image above, but it's capable of encoding 4Kp30 video using AVC or HEVC. It uses a single 1GHz Cortex A9 core, and it’s built on a 28nm process. The last two SoCs are A9SE and A12D. A12D is an entry level chip, while A9SE has some advanced functionality, but is intended for devices sitting at lower prices than ones that incorporate H2. A9SE offers 4Kp30 support, and can do 1080p60 video with electronic image stabilization. One of the demos that Ambarella showed was an example of their electronic image stabilization for 4K video. Part of the drive behind this is the fact that stabilization on drones has had to be implemented using a mechanical system that shifts the camera along each axis to keep the sensor in the same position. This type of system increases the size, mass, and cost of the drone, and so it's obviously something that drone makers would be keen to eliminate in order to allow for reduced prices and improved battery life. Above you can see a short video which compares two real time video feeds with EIS on and off. As you can see, the difference is dramatic, and the level of stabilization that can be done by the SoC is extremely impressive. 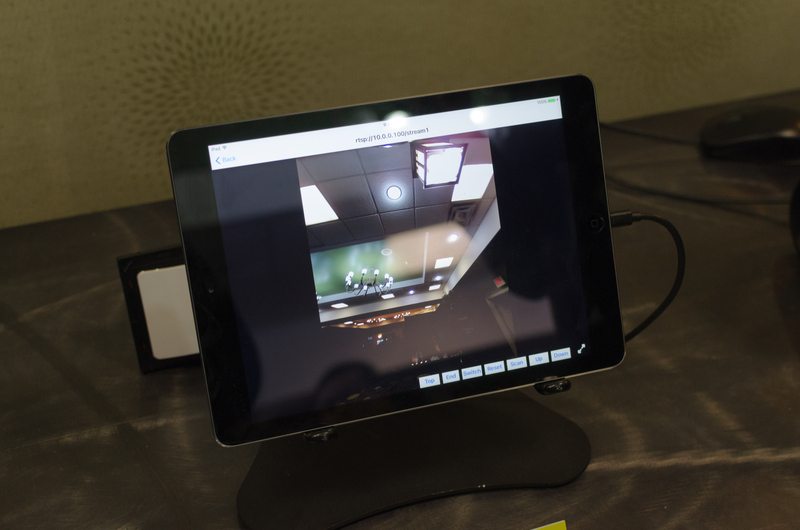 Another exhibit showcased the ability to record 4Kp120 video. This is the first time that I’ve seen any 4K footage recorded at a high enough frame rate to slow it down an appreciable amount. Several of the exhibits that Ambarella had related to technology that will be used in self driving cars. Some of this builds on demos that were shown at last year’s CES. The demo that I found most interesting is the electronic mirror. Essentially this is a mirror that integrates a display which streams footage from a rear-mounted camera on your car. 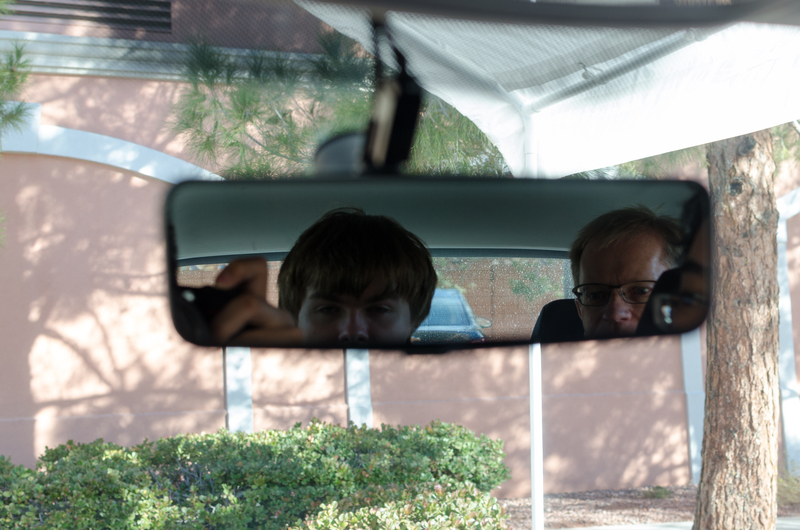 The reasons for using an electronic mirror include the ability to have a higher field of view, no obstruction from passengers in rear seats, and better visibility at night due to the HDR processing that can be done by the SoC at night in order to make the car behind you visible without making the headlights overpoweringly bright. It’s important to note that the mirror can act as a normal mirror in conditions when the camera is not necessary. 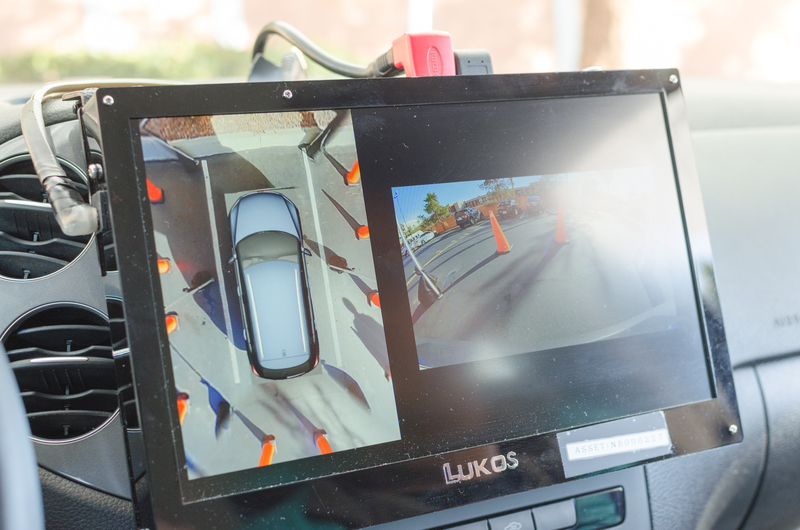 Another car-related demo from Ambarella involved mapping the environment around a vehicle using cameras mounted on the various sides. This isn’t exactly a new concept, but it does tie in with their new SoCs. Some things demoed included environment mapping for self-driving cars, and using the cameras to view an environment in order to implement features like automatic parking. The last demo that I found quite interesting demonstrated the image de-warping capabilities of the H2 and H12 SoCs. 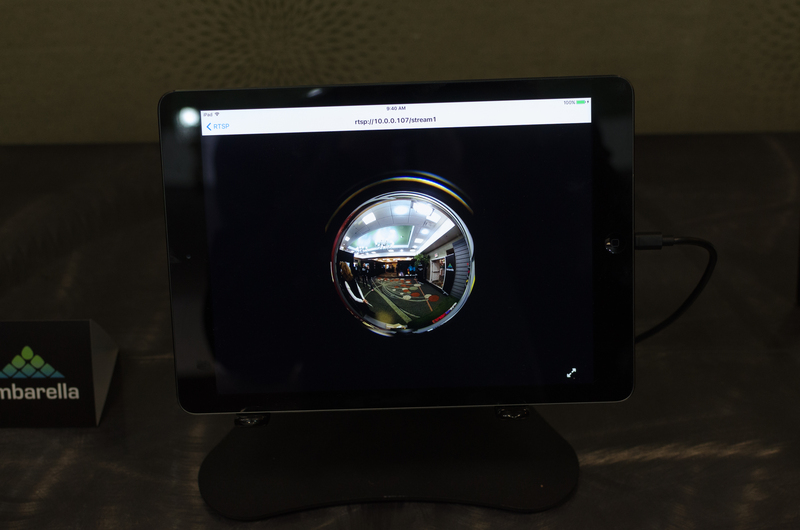 The demonstration shown gave the example of a fisheye camera being used in a security camera mounted on on a door, with the de-warping being used to put the image into a state that is easy to view. As far as real-time video encoding goes, the tech being shown off by Ambarella definitely impresses. I haven’t seen 4Kp120 recording in anything else that is consumer-focused, and the push for improved 4Kp60 HEVC encoding with 10-bit color and HDR support is something that will be necessary as new standards for UltraHD video are adopted. 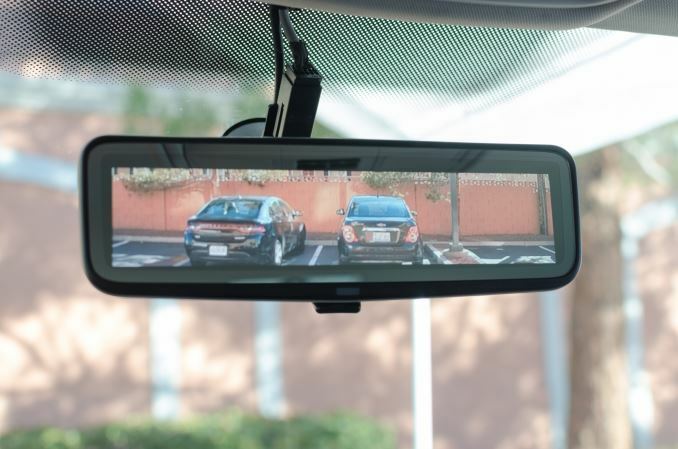 the rear-view mirror thing is interesting but if you put a camera-recorded image on it it changes the perceived distance of the stuff behind you. I hope there is a way to switch to an actual mirror.